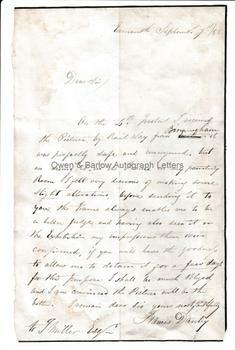 FRANCIS DANBY autograph Letter Signed. Irish painter. A member of the 'Bristol School' and with John Martin and J.M.W. Turner one of the leading artists of the Romantic Period. ALS. 1p. Exmouth. September 7th 1855. To T[homas] Miller. "On the 4th instant I received the picture by railway from Birmingham. It was perfectly safe and uninjured, but on seeing it, in its frame in my painting room I felt very desirous of making some slight alterations, before sending it to you. The frame always enables me to be a better judge and having also seen it in the Exhibition, my impressions there were confirmed. If you will have the goodness to allow me to detain it for a few days for this purpose I shall be much obliged and I am convinced the picture will be the better. I remain dear Sir, yours most faithfully, Francis Danby." 8vo. 18 x 11.5 cms (7 x 4.5 inches). Very slightly trimmed at left margin without loss of text, lacking blank leaf of bifolium. 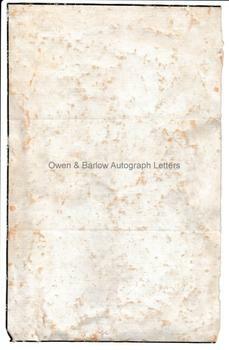 Browning spots and mounting traces to blank verso. Good. Francis Danby was a painter of large, highly dramatic canvases and is known for such paintings as 'The Deluge' and 'The Shipwreck'. His style, which is probably influenced by William Blake, is similar to that of John Martin and they both belong to the same group of English painters as J.M.W. Turner. Provenance: From the 19th century album of Emma Marshall of Penwortham Lodge, Preston. Emma was the daughter of William Marshall, landowner and cotton manufacturer, and was related by marriage to the Miller family of Baronets, MPs and landowners. Thomas Miller was a noted art collector and was the purchaser of Millais' 'The Peace Concluded' and other significant works.